Welcome to my messy kitchen! I’ve been so busy living and breathing recipe development for my cookbook that I’ve done a lousy job sharing the process. 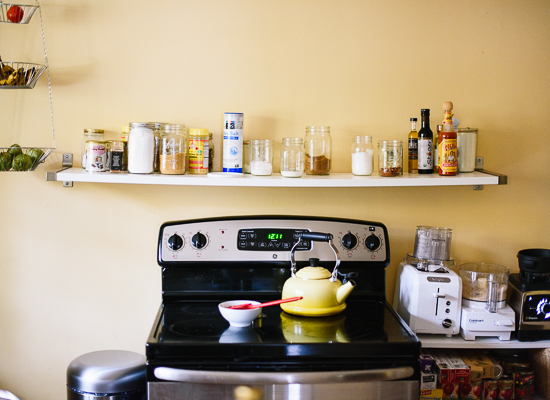 So today, I thought I’d give you an update and a very real look at my kitchen while we’re at it. On the cookbook front, I’ve created and worked through about half of the recipes for the book so far (that’s fifty recipes, with fifty more to go! ), with the help of my lovely and talented assistant, Mara. The chaos is always more organized when Mara is here. I make the most progress on Fridays, when Mara comes to help. She’s in nursing school and has Fridays off. To prepare, I clean my house, try to get most of the groceries we’ll need and edit and print all the recipes we’ll be making. Some days, I’m more prepared than others. She picks up any remaining groceries on the way over. 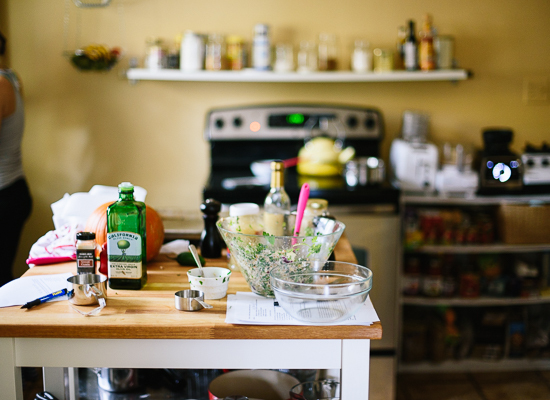 Sometimes, we’re making a recipe for the first time; other times, we’re making it for the fifth time. We can usually knock out ten recipes in one day, although we might only be finalizing a few. Imagine Mara as the busy worker bee and me as the mad scientist/absent-minded professor, wandering about and muttering ideas (“But wait! What if we…?”). That’s us. Mara is super helpful at providing feedback and asking questions about how to make the recipes, which helps me write them more clearly. Sometimes I’ll hand her a bowl of soup with five different garnishing options and ask her which one is best, because I’m nuts like that. I send her home with tons of leftovers to share with her husband. That’s her, in the photo below! On the days in between Fridays, I type up notes from our experiments, try more iterations myself, clean my kitchen one million times and make a lot of lists and trips to the grocery store. Sometimes, I park myself at my go-to coffee shop and type up head notes. With all of that, plus about three days per week spent on the blog, I’m working six or seven long days per week. It’s hard. I’m making a very purposeful effort to take Cookie on walks and attend yoga class three times a week, which is helping me maintain my sanity. I’m way overdue on happy hours with friends, which is ok only because this busy season has an end date. I’m planning to finish the bulk of the recipe development by the end of the year, so I can then, a) get my life back, somewhat, and b) focus on the recipe testing phase and photography. Everything is due at the end of April. By the time April rolls around, I hope to have a cookbook full of recipes that turn out wonderfully in your kitchens. You won’t see the finished product, Love Real Food, until spring 2017, but I’m already bursting with anticipation and hoping that you absolutely love it. Now then, let’s talk kitchens! I’ve learned the hard way that an organized kitchen is critical to a pleasant cooking experience. I’m making the most of a rental kitchen and I’m sure a lot of you are, too, so I hope you find some helpful ideas here. In summary, my rental kitchen is a far cry from my dream kitchens on Pinterest, but a million times better (and bigger) than my tiny old kitchen and the typical Manhattan kitchen. I try to remind myself of that every time I get frustrated. On the upside, the appliances are new and work properly most of the time (looking at you, dishwasher). However, I still wish my landlord would let me paint the walls white to reflect more light, and I curse the ancient, Duct-taped drawers every time I have to yank them open. The tile flooring is literally disintegrating below my bare feet, too. When I first moved in, the kitchen was really dark and offered tons of square footage, but not enough storage or counter space. I’ve supplemented with some easy solutions, which began with installing much brighter (100-watt equivalent) CFL light bulbs. You wouldn’t believe the difference that makes. My kitchen no longer feels like a dungeon. 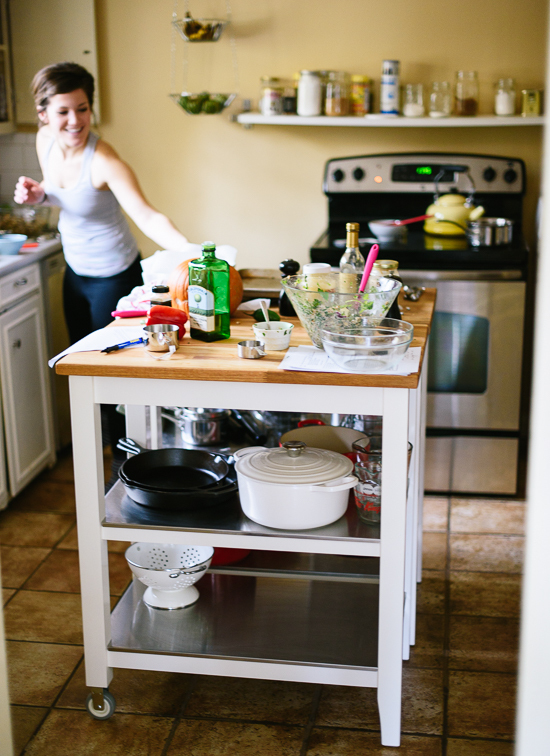 The kitchen island helps a ton, too. It provides both storage space for kitchen equipment and additional counter space. Mine is actually two Stenstorp kitchen carts from Ikea (one purchased on Craigslist) placed side by side, which works great. My six-tier wire shelf (also from Ikea, $50) offers a ton of new storage space and looks pretty nice, albeit industrial. I finally bought it after watching Mara struggle to find the flour wayyyyyy back in my lower cabinets. I also made a home for my blender, food processor and toaster on a super cheap three-tiered shelf (similar to this). They’re all connected to the same power strip, which is neatly hidden behind the shelves. Beyond the big pieces, I’ve cleared up some additional counter space by installing this $10 hanging basket and this hanging paper towel dispenser. Sometimes only a paper towel will do, and now the roll doesn’t take up space on my counter. I also installed a long shelf above my oven, which should have been two smaller shelves installed side-by-side since the shelf is bowing in the middle. Oops. I should mention my stainless steel step trash can from Target, which is easy to open even when my hands are messy. I also love these spice drawer liners, which help me keep my spice drawer organized. It was a hot mess before I added those liners. Last but not least, I find great joy in my matching hand soap and dishwashing soap from Target, which go nicely with my glass spray bottle of diluted Branch Basics Cleaning solution (c/o). It’s the little things. 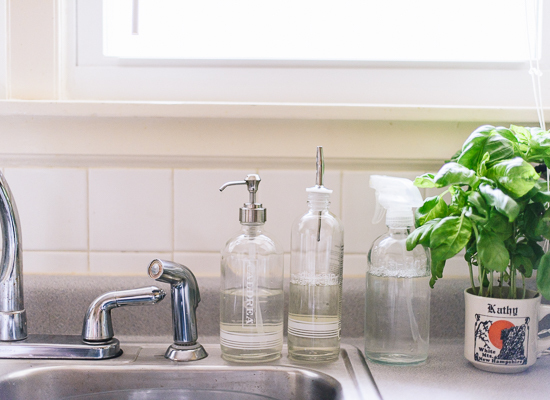 If you’re curious about anything else you see in my kitchen, check out my kitchen essentials shop here or ask in the comments! Don’t mind my four-legged assistant’s silly Halloween costume, below. 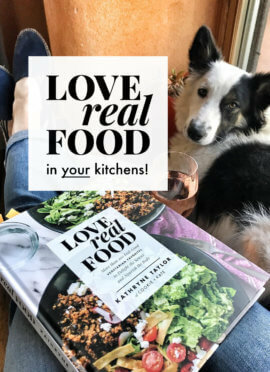 Love Real Food in Your Kitchens! Thank you for providing an inside look into the cookbook making process! I hope to make one some day. I’m not as meticulous as you are so I’ll definitely be take notes! Thanks, Carly! Best of luck with your future cookbook! Thank you very much, Nicola! Are you looking for testers? I have a friend in KC who has been in food service and loves cooking that might be interested. Thank you, Julie! I’m taking down names and contact info for testers now. I can’t pay for their help, but if your friend is looking for extra work, do let me know! I am so looking forward to your cookbook. Can’t wait to see what creative dishes you’ve dreamed up. Hope you include photos of Cookie too! Thanks, Karen! The book will have lots of Cookie pics in it, for sure! Just took some more today. I love this post! I can’t imagine how draining it must be to knock out TEN recipes in one day- good grief! Can’t wait for Spring 2017!! 10 recipes a day?? Wow – that’s impressive! Love all of your behind-the-scenes pics. Thanks for sharing them! It’s fun to see how it all happens behind the scenes. Thanks for taking the time to post this update. Looking forward to your cookbook! More of Cookie’s costume please! In all seriousness, it sounds like you’re tackling this whole cookbook thing wonderfully. I’m frankly amazed at how you’re managing to post as often as you do. Stay sane, stay healthy, and keep on going- I can’t wait to see what you put out. I love getting a behind the scenes look into your kitchen! And how awesome that you have Mara to help you one day per week. I’m sure having someone to help you eat all of that food is a big relief! It looks like you did a great job making good use of the space in your rental too. I have a rental kitchen as well (also with drawers that are falling apart…WTF) and I’ve found Ikea and The Container Store to be two of my saving graces! Thanks, Sarah! I would be losing my mind without Mara’s help. I really would. We just got a Container Store in KC and I’m afraid to walk in… pretty sure I’ll want the whole kitchen section! You’re welcome to our extras, Rachel! Maybe Mara can drop some by some Friday evening. Your kitchen sounds great, Amy! I don’t think there’s ever enough storage. Nope, never. I’m in awe. All I can say is you must be a miracle worker! 10 recipes in one day in that tiny kitchen. Impressive!! Looking forward to the finished product! What fun! Would be happy to recipe test if you need helpers. Is that kale coconut stir fry going to be in it? It’s my favourite of your past posts. Omg good. Thanks, Amy! I just added you to my list. :) I think I’m going to make a new riff on the kale coconut stir fry for the book. I haven’t gotten to that chapter yet. We’ll see if I can top the kale version! What fun to come into your kitchen and see what you’ve done. Maybe you can prop that long, bowing shelf up with something in the middle. I agree white walls are good, my whole house is white (not very creative however). The lights sure help. I do like lots of light. Good luck on that cookbook. I hope it all turns out beautifully. I probably should prop it up, before it collapses! I love all-white walls with lots of light. Your house sounds lovely. Haha. She was taking a little snooze in between crumb hunting, I’m sure. She’s worn the same costume for a few years now, so maybe I should get her another? I’ll try to get copies to South Africa for you! hmmm, maybe Cookie needs another costume hey…. she is so cute :-) . My brother lives in Connecticut, so I am sure he will be able to get me your book, should they not be available to South Africa. Thanks so much and have a great weekend. Susan, that’s so wonderful to hear! Thank you! This is so interesting to see! 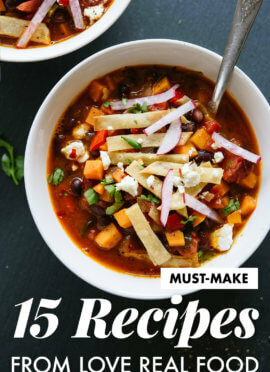 I can’t believe you manage to make ten (TEN) recipes in one day, that’s ridiculous! And so excited for your cookbook, it surprises me the thing is ‘done’ by April but then takes another year before it lands in the stores. Please keep us updated about the process, your recipes are lovely but these posts are so nice to read too. I hope you keep your sanity (or what’s left of it by now) for the remaining of the time, and am glad to read you have such a wonderful help! I’ve followed your blog for such a long time Kate! I cannot wait to get my hands on a copy of your cookbook. I’ve made some of your dishes and they’ve always been successful. Your blog was one of the first I read before I started my own and I love the photography and style that you have. Thank you so much, Angela! I really appreciate your kind words. Your blog looks lovely. Now I’m craving one of those chocolate chunk cookies! Hi Cecilia! Belated thank you for pointing out that issue. I just fixed it. 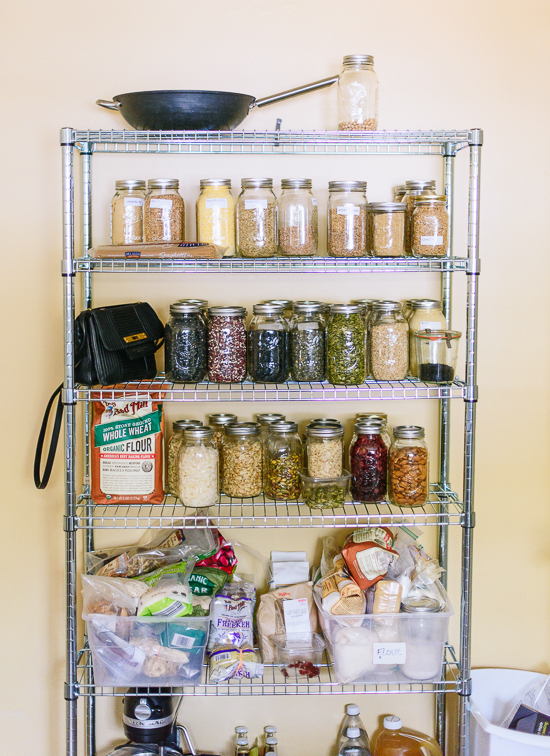 I love how you use the mason jars for storage! I’ve been thinking of doing something similar for awhile, but haven’t bitten the bullet yet. This just might be the push I need! Thanks, Heather! They work great! All your hard work will pay off….you have incredible recipes and beautiful photos. 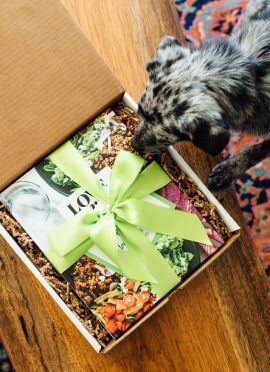 Your “first” cookbook will be a huge hit – and I can’t wait to order my copy!! The next time around (follow-up cookbook) will be a piece of cake! Thanks for the peek inside your world right now. Despite the chaos, this looks SO fun!! 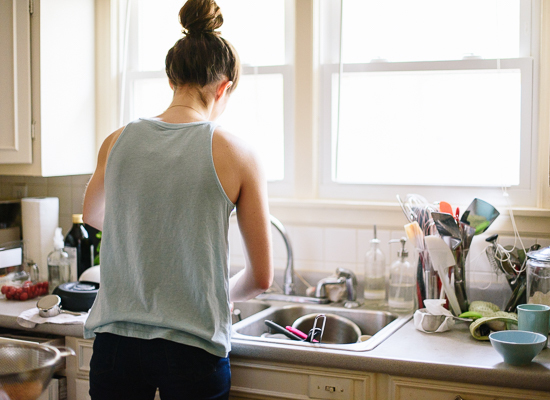 Where is your rental kitchen? 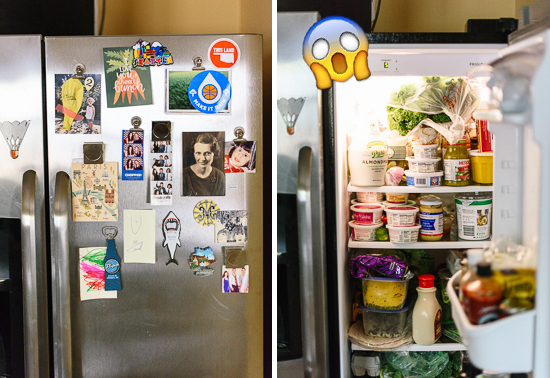 My NYC kitchen looks VERY similar to yours…So tiny! Congrats on the cookbook…I can’t wait to get my hands on it! Thanks, Chelsey! I’m half the country away, in Kansas City. My kitchen is bigger than it looks in these photos, I think… it’s just not the most functional of designs! Here in Western Pa. Enjoying this latest story. Of course I love all your recipes! Whom I’m weaning away from eating animals. My hubby just transferred to a mostly vegetarian diet after winning a bout with cancer. Your site has been my go-to when looking for more recipes to try on him. Even our two year old loves your recipes! I cannot wait for your cookbook, it will be requested as an essential investment in my kitchen! Hi Kristy, so glad to hear that your husband is doing well. Also glad to hear that you’re all enjoying my recipes! Yay! I love reading about the behind the scenes of cookbook making! I hope to start the process of having one published at some point in the next year or so. Thanks for sharing! Can’t wait for your book! Thanks, Abby! Good luck with your book-making process! I love your blog, I think it’s so great seeing and hearing about how the behind the scenes work! I can’t believe you do 10 recipes in one day, how do you do it?! That’s all my assistant! She’s a champ! Wow!! I’m so impressed that you can make up to 10 recipes in a single day. 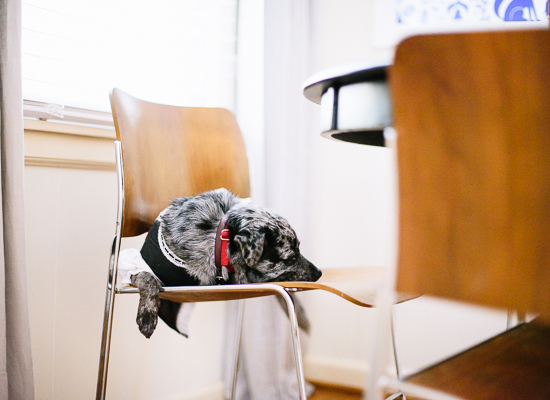 I’m burned out after 2 or 3… But then again, my only assistant is my little 15-pound pup, who can’t really offer her opinion or wash any dishes for me. ;) Good luck with the cookbook, and hang in there — it’ll all be over before you know it!! When Mara’s not here, I’m usually burned out after two or three. It’s too bad our little dogs can’t do the dishes! Kate, I noticed you have an electric stove. I can’t imagine cooking with anything other then gas… How do you like electric? It’s fine! I missed my gas stove when I moved here. The gas stove brought my water to boil quicker. Since I cook almost exclusively in cast iron and it’s not the best at distributing heat, sometimes I think that the electric burners might be better suited since they evenly heat the whole bottom of the pans. Just a personal theory. It’s nice to be able to wipe off the flat surface, but I have a bad habit of using the stove for storage, so I have to remind myself not to place anything on a hot burner. I must say that I am so glad that I found you when I was doing a search for vegetarian recipes. And everyday I try one of your recipes I get a WOW from my entire family. I try to plan every week what I must cook for lunch and dinner not a week goes by without at least half of the meals from cookieandkate. I must say you are really a great cook. I am so happy that your cook book is going well and I can assure you I would be the first one to go buy one when it gets released. But today’s post gave me a small worry. Does it mean that you might not post any recipes after that? Hi Gayathri! I’m sorry for my delay. So glad you all are enjoying my recipes so much! Don’t worry, I won’t quit posting new recipes on the blog! Yay! Thanks, Kristin. Can’t wait for you to see what I’ve been working on! Thanks for the behind the scenes – it is great to see how different the process is for everyone! Hello Kate! 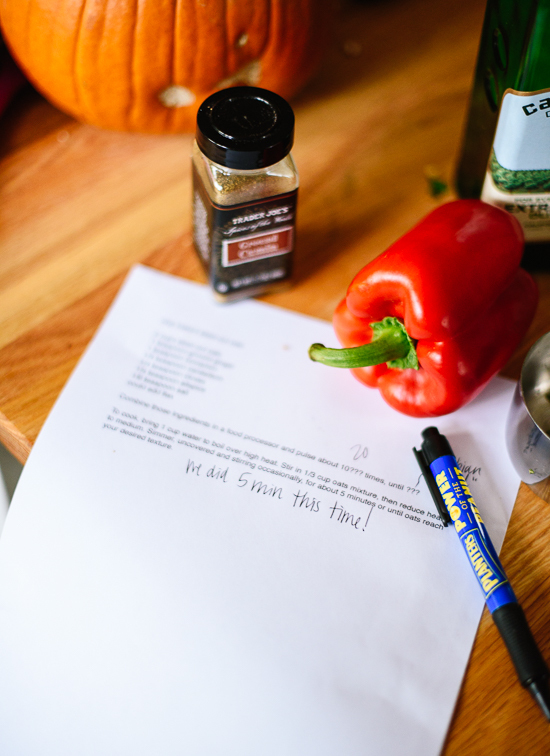 Thanks for sharing the behind the scenes in the making / writing of a cookbook! I find it so interesting looking at the process behind the product especially since we have to wait till 2017 to get the book. Also it’s nice to see that I am not the only one working with a less than optimal kitchen in my rental apartment. I can only imagine how insanely busy you must be! I have so much respect for people like you who work on EVERY ASPECT of your cookbook. And yet, you’re still keeping up with this space. Props to you, woman! I can’t wait to see the final result of all of this hard work. Such a fun post to read, Kate! I totally get a sense of the craziness and your hard-working spirit. :) Looking forward to your book! This might sound like a silly question, but why the long wait from April next year til spring the year after…? Hi Jadzia! That’s not a silly question. Publishers need about a year to turn a manuscript into a book. They take all of my written pieces and photographs, edit them, design the book, print the books and distribute them. It’s quite a project! I’m accustomed to publishing recipes right when they’re ready, so keeping them to myself for this long is hard! This post totally speaks to me, you captured this experience so well. I’m still in the throws also of recipe testing for a book and happy to know I’m not the only one who feels the right garnish can make or break a dish:) Can’t wait for your book! Congrats on the cookbook! Looking forward to Spring 2017. Who are you publishing with? Thanks, Melissa! I’m working with Rodale. So so excited you’re making a cookbook!! Yayyyyy, thank you, Christie! You just made my day. I’m trying to get it to you as soon as I can! When I ask my 9 and 6 year old boys what they would like for dinner the most common answer is “kale salad” LOL. I’ve just discovered your blog and love everything about it! Could I ask about where you purchased the beautiful copper cooling rack featured in the banana bread video and Blueberry Baked Oatmeal recipe page? Many thanks! You’re so sweet, Sima! Thank you so mcuh.